Narsiso Martinez of California State University, Long Beach was awarded a 2018 Dedalus Foundation MFA Fellowship in Painting & Sculpture. The Fellowship carries a $25,000 stipend. Mr. Martinez was born in Oaxaca, Mexico and came to the United States when he was 20 years old. His work is based on personal experience as a farmworker. Drawing on the inspiration of past master artists as diverse as Jean-Francois Millet, Vincent van Gogh, and David Alfaro Siqueiros, Mr. Martinez offers a critique of the food industry by contrasting symbols of corporate agribusiness with images of its laborers. 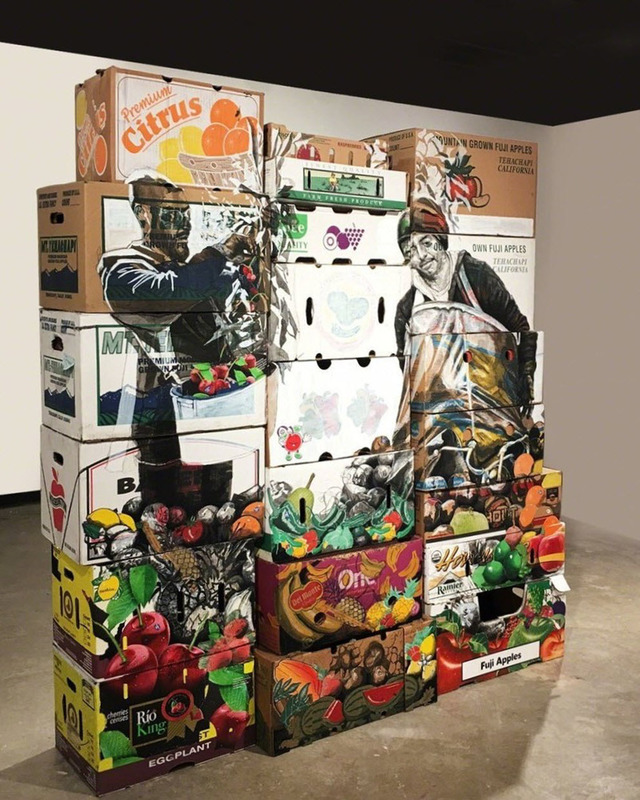 He deftly juxtaposes charcoal portraits of agricultural workers on reclaimed produce boxes to illuminate the socioeconomic disparities of agribusiness.